With the bulk of free agency complete, one thing is clear in the NFC North. Three of the four teams are currently without a veteran backup quarterback. Hopes must be high that Matthew Stafford, Jay Cutler and Aaron Rodgers stay healthy. The Detroit Lions lost Shaun Hill to the St. Louis Rams and have not replaced him. Also, the Chicago Bears saw Josh McCown leave for Tampa Bay where he was named the starter by former Bears coach Lovie Smith, who is now the Bucs coach. Green Bay, the team that suffered the most last season without a veteran backup for Aaron Rodgers, was able to sign Matt Flynn to get them to the playoffs. Packers coach Mike McCarthy has said he would like to re-sign Flynn but hasn’t gotten a deal done. Flynn is still available but apparently he’s not a hot commodity. 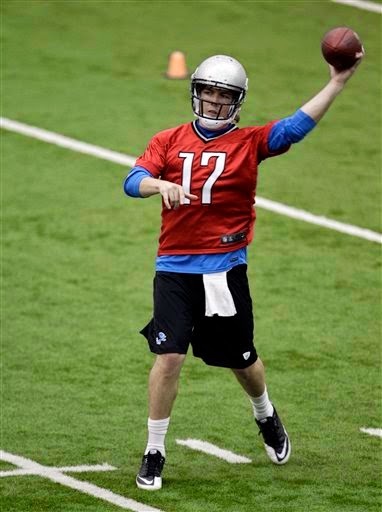 So as the rosters stand now the Lions have Kellen Moore to back up Stafford. Moore, who has spent two seasons with the Lions, has shown improvement in training camp and the preseason, but has never played a snap in a regular season game. The Packers have Scott Tolzien who played in three games with two starts after Rodgers was injured last season and threw one touchdown and five interceptions in the three losses. Jordan Palmer remains with the Bears, but he has played in one game since 2010. In his five-year career he’s played in four games with 10 completions. Also Jerrod Johnson was on the Bears practice squad in 2013. Including Flynn, a few veterans are still available on the free agent market — Josh Freeman, Kevin Kolb, Colt McCoy, David Garrard, Dan Orlovsky and Rex Grossman. It’s possible the teams will look to the draft, but there’s nothing like an experienced veteran as a backup. Just in case. Oh, I didn’t forget the Minnesota Vikings who have quarterbacks Matt Cassel and Christian Ponder on the roster. Can’t tell if they have a good backup, because not sure who will start. Cassel started six games last season with 11 touchdowns and nine interceptions. That included the win over the Lions in the season finale. Ponder started nine with seven touchdowns and nine interceptions.